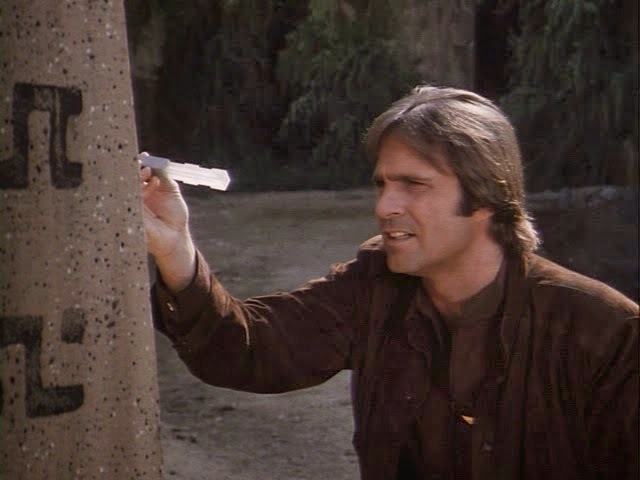 In “The Hand of the Goral,” a shuttle carrying Buck (Gil Gerard) and Hawk (Thom Christopher), and a Starfighter piloted by Colonel Deering (Erin Gray) explores a habitable planet. 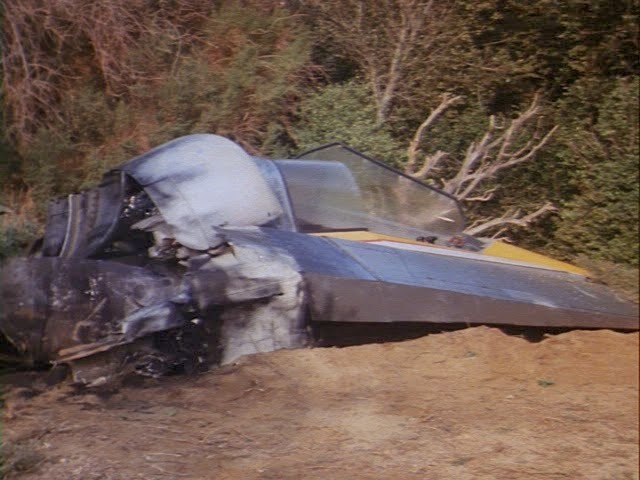 On the surface of that mysterious planet, the crew finds the wreckage of a ship, and an injured survivor, named Reardon (Peter Kastner). Ten thousand years ago, the world was inhabited by a race called the Goral, but they undertook a mass exodus, and the planet was abandoned. 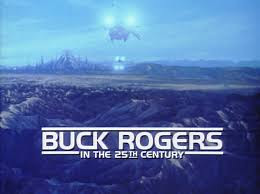 Following some strange and inexplicable events on the planet surface, Hawk and Buck follow Wilma back to the Searcher. There, they find the crew-members strangely altered. Admiral Asimov (Jay Garner) has become a raging tyrant, Crichton has become friendly and appreciative of humans, and Twiki is a grumbly, resentful sort. With Asimov threatening to kill and torture crew members, Buck, Hawk and Wilma resolve to return to the planet and figure out what has happened, but their escape won’t be easy. Buck realizes that all the crew members are duplicates meant to trick them, and proceeds to the planet below, only to be confronted with a being (John Fujioka) who promises him great riches if he cans solve the riddle of the Goral. I suppose that I tend to go easier on the second season of Buck Rogers than many fans did in the early 1980s. The season is not as much fun as the first, but I like the addition of Hawk -- a solid “resident” alien character -- and feel that some of the stories were compelling. I like “The Guardians,” in particular. 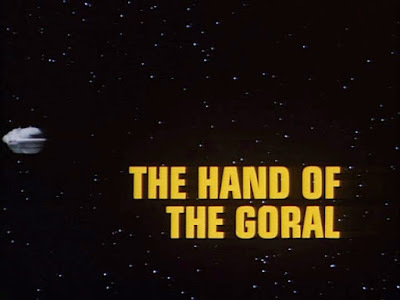 “The Hand of the Goral” is not without its problems, but it too would get ranked in the upper tier of second season installments. The idea of a duplicate Searcher, where characters possess altered personalities immediately puts one in mind of Star Trek episodes such as “Mirror, Mirror,” it’s true, but in this case, an alternate universe is not at work. Rather, an alien games-player, or “tester,” the titular hand of the Goral, is responsible. He was left behind by his people to protect the planet from intruders, and determine their worthiness to receive the wisdom and riches of the Goral. He refers to the strange duplicates as “simulacra,” and certainly his powers are fierce. 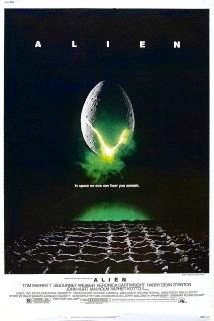 There have been many attempts in science fiction stories to tell stories in which protagonists encounter duplicate versions of the habitat, and must determine if it is real or not. On Star Trek, Kirk was confronted with a complete mock-up of the Enterprise in “The Mark of Gideon.” The Alphans encountered a duplicate of their moon base in Space:1999’s “One Moment of Humanity,” and here Buck, Hawk and Wilma visit a duplicate Searcher, replete with a crew of simulacra. At least in this case, it is made clear that the hand of Goral possesses incredible powers and energy stores by which to create these settings and characters. It’s intriguing to meet the Searcher crew recreated as “imperfect fakes.” Asimov is a dictator, Crichton is nice, and Wilma suddenly is all clingy and frightened. It’s not they are “evil” parallel versions, just versions that are off, and require deciphering on Buck’s part. 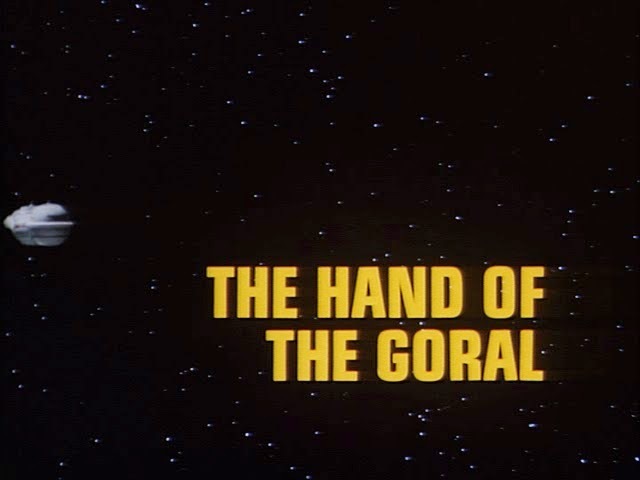 Overall “The Hand of the Goral” is tense, keeps one guessing, and doesn’t rely on a ridiculous premise (see: “The Golden Man”) to sell its story. I love stories about mysterious planets, or planets “of death,” with their ancient, inscrutable mysteries. “The Hand of the Goral” may not be terribly original, but it possesses a creepy vibe, and a sense that an unseen force is manipulating reality itself. In a not always successful second season, those qualities are enough to make the episode stand out from the pack.